Breakfast, meet my friend(s) (is anyone actually reading this little blog of mine?). 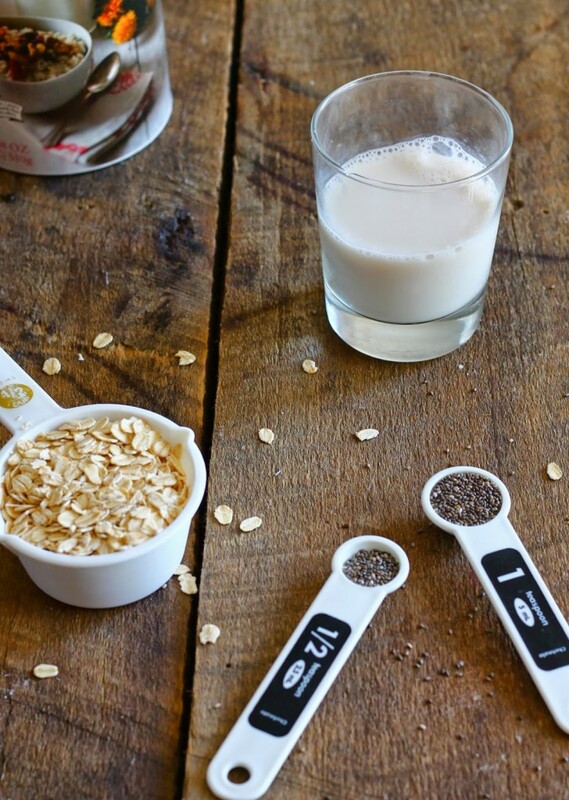 Invisible friends, meet a super easy breakfast that requires about 30 seconds of actual work. Your mornings will be changed. I love breakfast and if you knew me at all in college, brunch was my favorite meal. We would literally be in line at 11 am when the dining hall opened. A typical brunch involved the most delicious made-to-order omelet, half a bagel smothered in cream cheese, some bacon and sausage along with a pancake or french toast if I felt like it, a bowl of fruit (aka just the honeydew pieces), and chocolate milk. And then if I wanted more, I went back for seconds. I don’t know how I didn’t really gain weight in college because I ate like a horse. Back to breakfast. Bagels, fried eggs, bacon, muffins, waffles, omelets, coffee/tea, pancakes.. Literally anything I can eat for breakfast/brunch I love. However, the recurring problem in my life is that it’s hard and not super fun to cook and then sit down and eat breakfast for one person. Like how do you make pancakes for one or bacon for just one person. Whenever I cook bacon, I need to make the whole package and then it’s gone in about 5 minutes or less. And it’s especially difficult to make a breakfast that’s relatively good for me and will keep me full for longer than 1.04534 seconds. So before I moved to LA and even when I first moved out here, I was super big on oatmeal. It kept me full the longest and with some cinnamon and sugar, it was delicious. But then I stopped because as it got warmer and warmer outside, I was less inclined to eat a hot bowl of oatmeal for breakfast. Even though I drink tea almost every day, even if it’s absurdly hot out, I couldn’t do the oatmeal. 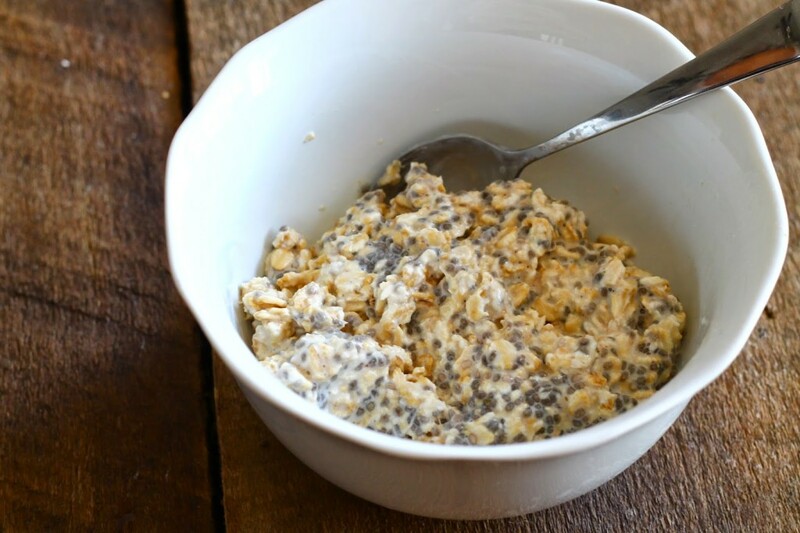 Then, during my daily blog reading session, I saw that Two Peas and Their Pod posted about something called overnight oats and I was intrigued. It involved oats that were prepped quickly the night before, chilled in the fridge, and then ready to eat (cold) in the morning. It honestly sounded like magic. I trolled around the internet some more because I didn’t like that their recipe used yogurt. I searched around some more and then decided to test out the refrigerator magic on my own. 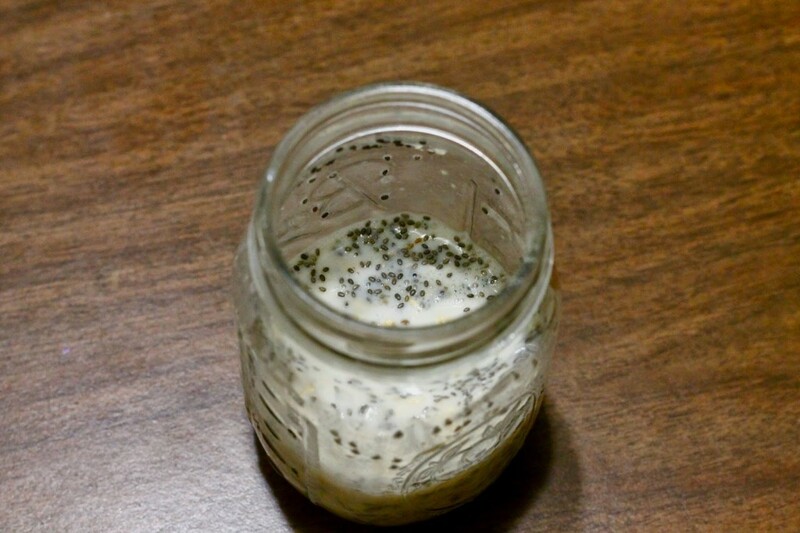 I also added in chia seeds because I loved the texture and the extra nutrients I get from them. And the verdict? It changed my breakfast routine. I could make them in about 30-45 seconds the night before, didn’t even have to think about breakfast, and they actually kept me full. I’ve converted a few friends too who now swear by them (Hi Lindsey). The two above pictures show the before (just added to a mason jar) and then the next morning, added to a bowl for breakfast. It’s magic! 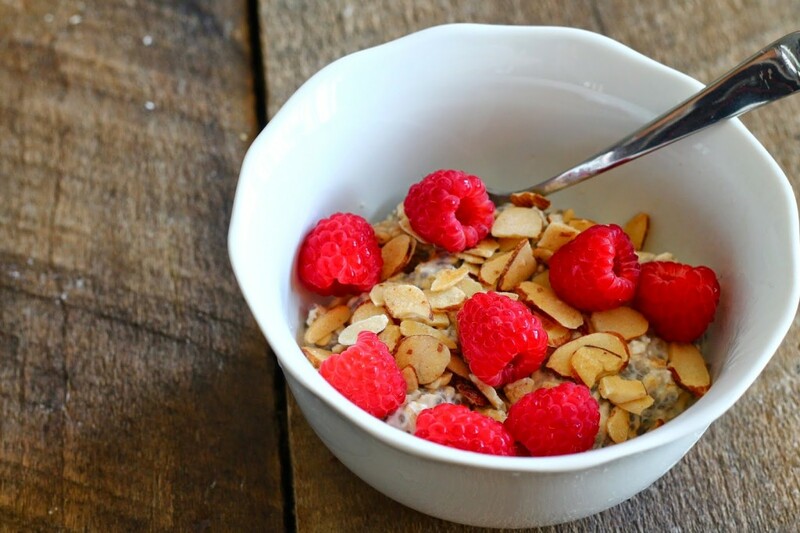 Usually I’m boring and eat them plain but then I added some honey roasted sliced almonds and fresh raspberries and it made it SO much better. Get ready for some more exciting breakfast options. 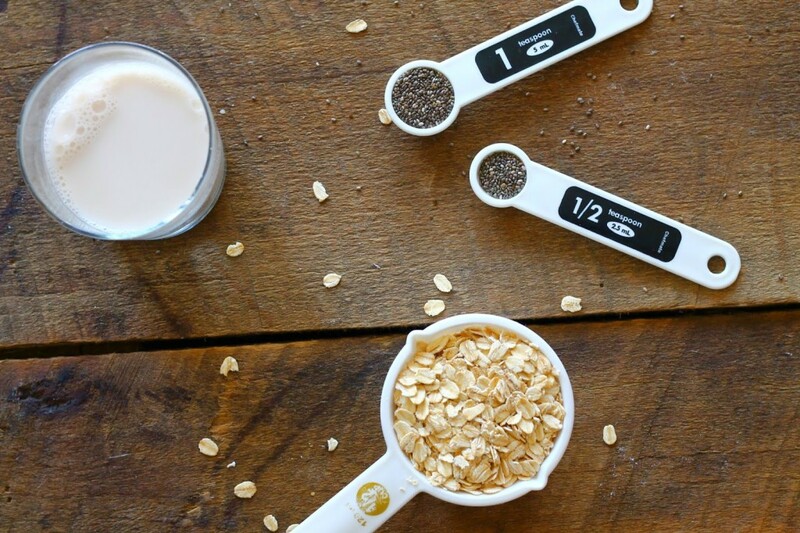 In a mason jar or a tupperware, combine uncooked oats, almond milk, and chia seeds. Cover and swirl gently so everything mixes together. Refrigerate overnight (or up to 2-3 days). In the morning, remove from fridge. You can either eat out of the container or put them in a separate bowl. 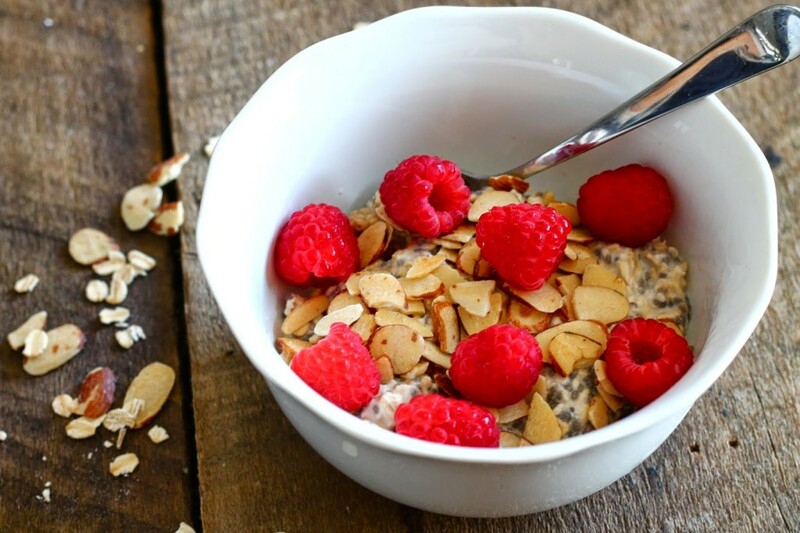 Add almonds and raspberries, and enjoy!